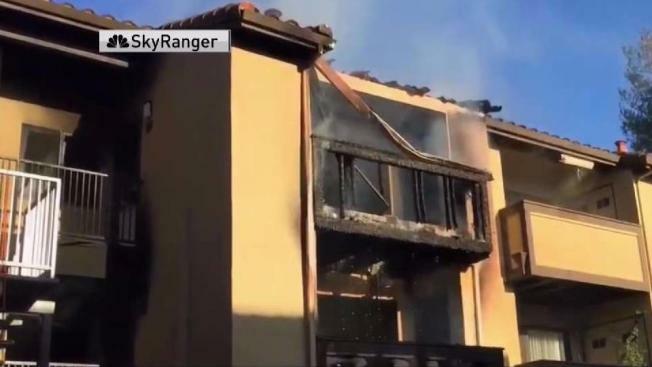 Two firefighters were hospitalized with minor injuries they suffered while battling a two-alarm fire at a condominium complex in Fremont on Tuesday, according to the Fremont Fire Department. The fire was reported at about 3:40 p.m. at 81 Shaniko Common, in the city's Warm Springs neighborhood, fire officials said. Firefighters had the blaze knocked down quickly and contained by 4:30 p.m., fire officials said. Two units at the large complex were completely destroyed by the fire, and four other units have been damaged, fire officials said. It hadn't yet been determined when residents of the damaged units would be able to return. One firefighter suffered second-degree burns to his legs when his leg went through a hole in a balcony on the third floor of the building during the initial attack on the blaze, officials said. Another firefighter suffered a back injury a little later. The cause and origin of the fire are still being investigated, fire officials said.